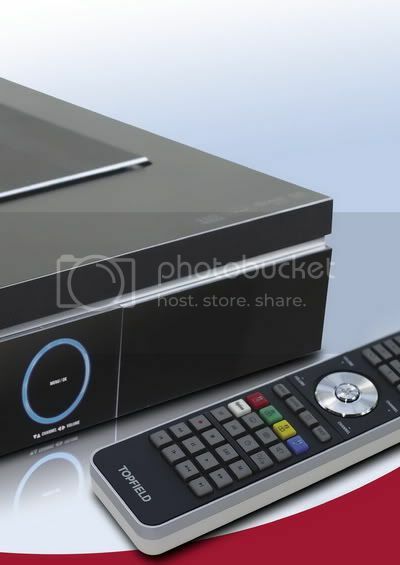 Multimedia HD Receiver Topfield TMS SRP-2100, Broadband Each satellite dish tv receiver box we buy prominently features a brand name on its front. In actual fact, however, no manufacturer develops and produces all components in-house, but rather sources individual parts from various suppliers and then assembles the Topfield TMS SRP-2100 receiver. One of the decisive components always is the main chipset, as it determines how well incoming audio and video data are processed. A good quality receiver must feature a good quality chipset to guarantee brilliant sound and pictures, a wide range of applications and operational stability. Slightly over a year ago we witnessed the large scale transition from SDTV to HDTV using DVB-S2/H.264. This of course required a totally new chipset to make sure high definition signals can be processed next to conventional standard definition offerings. We all know that new technology often brings with it new problems and new bugs that take some time to be resolved.The first DVB-S2/H.264 chipsets were no different and more or less any manufacturer of HDTV receiver experienced some kind of teething problems. The more features a brand tried to pack into their innovative best satellite tv HD boxes, the more prone to glitches they actually were. In the meantime, however, chip manufacturers have had some time to look at the problems and figure out how to solve them, so that the Topfield TMS SRP-2100 now is one of the first receivers using the latest and improved DVB-S2/H.264 chipset. Topfield of South Korea it self the Leader of Multimedia Home, and it is exactly that claim which the company wants to prove right with its new product. Many months ago, a team of Topfield engineers went about design-ing this next-generation HD receiver. What was clear right from the very start was that the Internet would be playing a significant role next to conventional satellite TV reception. Speaking of which, it is no coincidence that TELE-satellite opted to add broadband to its title, because we too expect that in future it will make no difference to consumers where TV and radio content comes from. Satellite, cable, terrestrial and broadband Internet will all be equally purposeful sources of multimedia content and one day we will not even bother to think about where TV content comes from. 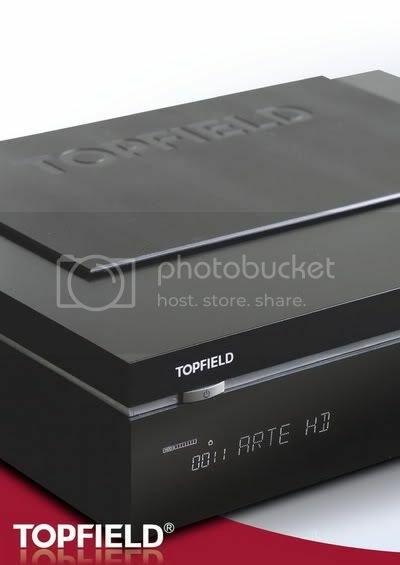 The engineers at Topfield also streamlined this anticipation into their new TMS receiver and therefore made sure it does not only come with two DVB-S2 compatible tuners, but also with a fully functional network interface as one of its key features. Topfield decided that new technology on the inside also requires a new appearance on the outside. Forever gone are more or less hidden buttons on the front panel the future lies in a touch sensitive control panel which does away with obtrusive buttons altogether.The TMS (which, incidentally, stands for Total Media Solutions) is some three centimetres higher than comparable satellite receivers, but thanks to its stylish front panel design this does not make it look bold at all. After all, there is only one single button positioned right above the perfectly readable VFD display: the one to turn the box on and off. All other control segments are located next to it in a perfect circle, and they are activated simply by touching the front panel, which is a very smart concept. When the receiver is switched on these segments are surrounded by a shiny blue LED ring, which we found a tick too bright in a dark viewing environment. Being able to dim or de-activate this LED would be greatly appreciated. A flap on the right side of the front panel hides two CI slots which can take in any standard conditional access module for pay TV reception (such as Viaccess, Cryptoworks, Nagravision, Alphacrypt etc. ), as well as two USB ports for connecting external hard disks or other storage media such as digital camera and the like. 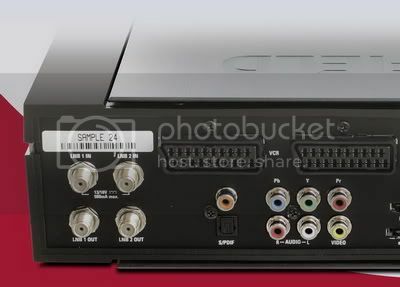 The back panel proves its worth as well, as it comes with the mandatory HDMI socket, two scart euro connectors, six RCA sockets for YUV, CVBS and stereo audio, a USB port, an E-SATA slot, a network interface, a coax and a digital audio output and of course the two DVB-S2 compatible tuners complete with loop-through outputs. To broaden our smile even further,Topfield also added a mechanical mains switch on the back panel. Contrary to most Topfield receiver in the past the new TMS comes with a small fan to provide cooling for the hard disk and the power unit. In the pilot receiver we had available for testing the fan produced a rather disturbing high-pitch noise. Topfield has assured us,however, that a more silent fan and an improved power unit will be used for serial production. The remote control that is shipped with the TMS sits nicely in your hand and sports an easy-to-use layout design. All keys are clearly labelled and provide enough feedback when pressed. If only the quality of the Topfield TMS SRP-2100 remote would equal that of the TF7700HDPVR we’d feel like we were in heaven. As this, unfortunately, is not the case we have to say that while the remote is good enough to use, it does not equal the top-notch design and feel of the receiver it is meant to control. On a friendlier note, we loved the fact that you can also con-trol your TV, DVD player and amplifier with the very same remote.The user’s manual includes a comprehensive list of codes for various manufacturer so that the remote can be configured to work with your existing living room equipment. When tested by us, this feature worked truly flawlessly. In addition, Topfield decided to ship a fully-fledged wireless keyboard with its TMS, even though it currently can only be used for the integrated Battle Tank video game. Plans are in the pipeline, though, to add an Internet browser to the receiver’s operating system in future, for which the keyboard will be extremely handy. If the wireless keyboard is used a small dongle has to be attached to one of the available USB ports of the receiver so that signals can actually be transmitted from the keyboard to the box. This impressive list of features is rounded off with an included HDMI cable and an extremely useful user’s manual something we have come to expect and appreciate from Topfield in the past.It provides detailed information on all features of the receiver, has a brilliant layout and included illustrations and pictures where required. When Topfield advised us some weeks ago that the new TMS would be sent to us for testing, we could hardly wait for the day it would arrive at our test lab. When that day had finally come,we were even quicker than usual to set up the receiver to our reception system and to connect it to our plasma TV in the test lab. When switched on for the first time the receiver want stok now the preferred language for the OSD, with the following options being available: English, French, German, Dutch, Italian and Spanish. Even though the receiver came with a comprehensive channel list that was obviously geared towards the German-speaking market, the next step in the initial setup process was a channel search. The Topfield TMS SRP-2100 comes with an up-to-date list of 150 European and Asian satellite positions for KU and C band transmissions. The transponder database turned out to be just as current. As far as antenna settings are concerned the TMS seems to be happy with anything that is thrown at it. All DiSEqC protocols (1.0, 1.1, 1.2 and 1.3) are supported which means that a simple single antenna is just as fine as a multi focus antenna with up to 16 LNBs or an antenna with a DiSEqC motor. A number of generally used LOFs are pre-set and in case you own a more exotic LNB you may even set the required LOF manually. 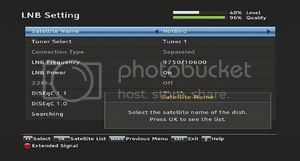 In order to make full use of twin tuner PVR both tuners should be fed with a separate line from the antenna so that two recordings (even from two different satellites) can be made simultaneously while playing back a third event. In case there is only one line available the loop-through output of tuner 1 can be connected to the input of tuner 2, which means that not all channels are available on tuner 2. Broadband A channel search was per-formed quite swiftly and only took about eight minutes for HOTBIRD 13° East with its more than 100 transponders. But then again, we would have expected nothing less from Topfield.Naturally,any search can be restricted to FTA or encrypted channels only, and channels that are not pre-stored on the transponder list can easily be found using the satellite tv network search mode. For professionals among you Topfield has even thought of implementing manual PID input. The only feature genuine DXers will miss is blind scan, which is not available with the TMS. The TMS’s tuner had a pleas-ant surprise in store for us: Not only did he lock SCPC signals from TURKSAT 42° East effortlessly, it also left a great impression when we tried to receive signals from transponders that only come in very weakly at our location (such as the ones from NILESAT 7° West or ASTRA2D 28.2° East, for example). When we repeated the test under lab conditions the excellent reception quality of the tuner was confirmed.A C/N value of a little over 4 dB was enough for a stable and error-free picture on our plasma TV. It’s the same old story when-ever a new satellite receiver arrives at home: Hundreds or even thousands of channels are found with the channel search, and then the gruesome job starts of bringing some order into this huge mess. In our case, far more than 2000 TV channels and countless radio stations filled the over all list,but thank fully Topfield has a reputation of taking the horror out of channel list editing and the TMS is no exception. Its channel memory accepts up to 7000 TV channels and up to 3000 radio stations and can be edited to your heart’s con-tent. Apart from an automatic basic structuring it allows manually moving, deleting, renaming or PIN-locking individual entries. Just as easily, you can move channels you watch on a regular basis to a favourites list, which itself can be subdivided into up to 30 categories. This way you can build up genre-related personal lists, create a dedicated HDTV list or each member of your family can use a customised list all for him/herself. Before we exit the main menu which, incidentally, is conveniently divided into five categories it makes sense to have a look at TMS system settings and to adjust same parameters, if need be. Like other digital satellite receiver, the TMS can be set to automatically sync local time via satellite. What sounds like a great idea also has its drawback, as some channels transmit erroneous time signals and cause a wrong time to be set in the receiver.To counter this problem, the TMS allows limiting this feature to certain predefined transponders or channels, which may even be encrypted channels. This is a very handsome feature that we have been waiting for for-ever and a day. Via HDMI the TMS can provide either 576i, 576p, 720p, or 1080i, or you may choose the automatic mode which selects the most suitable res-olution based on the received signal. We particularly liked the Video Format key on the remote control to quickly change resolutions. The scart euro connector delivers CVBS, S-Video or RGB signals, and users can predefine how 4:3 material wil be presented on a 16:9 com(Pan & Scan or original format with black bars to both sides). Even though hardly anyone will use it these days, it is even possible to set signal output at 4:3 for older TV sets. As the name suggests the recording and playback settings allow defining the receiver’s behaviour during recording and playing back. The time shift buffer has been extended to cover up to 300 minutes now, up from the 120 minutes that had been available in the past. In addition you can have the receiver add a preset number of minutes before and after each timer recording to make sure not to miss a thing in case a channel does not stick precisely to its schedule. If external storage media are connected through the USB or E-SATA ports they can be nominated as the default storage medium. So if you would like to use a USB disk rather than the internal 500 GB hard disk you can easily set up the box to address this external disk. Another first is that it is possible to continue playback from where it was stopped before. Up until now a separate TAP (in-house plug-in from Top-field) had been required to use this feature. Also, various fast forward and rewind speeds are available and users can define how the receiver is to deal with encrypted recordings. Either they are decrypted right away by creating a copy or the user activates this procedure manually. The front display of the TMS can be customised in a number of ways, for instance using different display modes or adjusting display brightness for standby and on. We would be even happier if the same was true for the blue LED ring on the front panel as well. 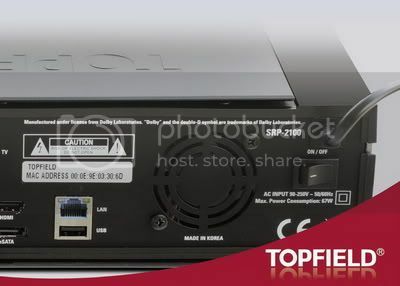 If you intend to connect the receiver to the outside world the Topfield TMS does not only have the USB and E-SATA ports at your disposal, but also a fully-fledged network interface which can be set up in a dedicated menu area. It allows users to assign an IP address manually or automatically by a DHCP server that is integrated in the network. In case automatic assignment is available the TMS will receive all required parameters auto-matically and will be ready to go within seconds. A web server and an FTP server are also integrated in the receiver and both of them can be activated or deactivated individually. Obviously, the TMS satellite tv offers access protection through user ID and password. Once the initial configuration is finished all you have to do is press the Exit key on the remote to prompt the receiver to exit the main menu. It immediately switches to the first available channel on the list and inserts a small info bar on the bottom of the screen. It includes information on the currently showing event, a progress bar to show how far into the event you are, as well as details regarding the active tuner, satellite and transponder. 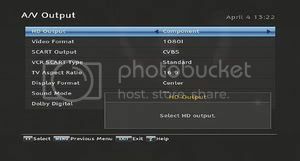 Additional icons provide information on available services such as teletext, subtitles, additional audio tracks, or whether you are currently watching an encrypted or multifeed channel. All this is rounded off with two bars indicating signal strength and signal quality. Beware of these values, how-ever, as we have found that they might not be 100% accu-rate, especially when it comes to weak signals. If you press the Info key the receiver will display additional content information on the current event, if provided by the channel. The EPG pops up by pressing the Guide key and Topfield has yet again managed to develop a very user-friendly layout.Information for up to seven days in advance can be accessed, provided this information is transmitted by the channel. Two display modes are avail-able: The first shows a grid with seven channels at a time for a time period of approximately three hours, the second mode also consists of a grid layout, but this time featuring five channels with a time period of approximately four hours. While you’re using the EPG the Info key brings up detailed information on the selected event, which can be marked to create a timer entry for a recording or reminder.It could not be easier to create a timer entry yet of course there is always the option left to create a manual entry as well if you do not want to be restricted to scheduled-defined begin and end times. Set entries can be repeated daily, weekly, each workday or each weekend, so you’re really left with all imaginable automatic recording options.In our test the receiver also reliably identified and advised of any timer conflicts involving overlapping recordings, even if they overlapped a couple of minutes only. In good Topfield tradition the OK button calls up the channel list, which sports a convenient design and offers a whole range of sorting options. If desired the receiver can even display satellite tv providers details for each channel, and the touch of a button brings you right to favourite list view.We particularly liked the channel search feature which shows all channels whose name starts with a given character (press once: all channels starting with A; press twice: all channels starting with B; and so on). With potentially thousands of channels on the list this feature brings you to what you’re looking for really fast.Zapping is fun with the TMS, it doesn’t take longer than one second to switch between SDTV channels, and approximately two seconds before a HDTV channel appears on the TV.When testing a receiver we often zap up and down the list like there is no tomorrow, yet the TMS did never answer with any major video or audio faults. In general, we truly loved the video and audio quality provided by this receiver, which was excellent for both SD and HD signals. Thanks to the built-in 500 GB hard disk you will soon collect a lot of recorded events. To help you keep track of what you have recorded it is possible to freely create folders into which you can move recorded events. Each recording comes complete with a preview pic-ture and detailed information on length and size of the recording. In case you’re wondering: 500 GB of hard disk are good for roughly 250 hours of viewing. The files system used by Topfield is JFS,even though a number of other formats (such as FAT32, NTFS or EXT2/3, for example) can be read was well. Only JFS and EXT2/3 can be written, however, which you should keep in mind when trying to edit recordings on your PC.The perfect overall impression of the TMS is rounded off by flawless selection of audio tracks, perfect insertion of subtitles, NVOD support and integrated teletext decoder. If you belong to the impatient kind and prefer to watch other channels during commercial breaks you will probably love PiP (picture-in-picture), which even works with two HD channels! We should not forget to mention a feature called auto-matic system restore which works like that: With the touch of a button you can save the current receiver status, which can be restored at any later stage, if some thing goes berserk with your settings. The restore file can be saved both in the internal memory and on external storage media, so you are always on the safe side.Topfield never stops improving its products, and that is why new software is made available for download from time to time. Updates can be made via satellite, network or via a USB memory stick. As mentioned above Topfield believes the future will see a merging of different reception avenues. TV and radio con-tent will still be provided via satellite, cable, or terrestrial broadcasting, but will be complemented to a considerable extent by the Internet.This is why the network inter-face of the TMS has received special attention right from the start. Not only does it allow controlling the receiver via the Internet or a local network thanks to the integrated web server, you can also access the receiver’s hard disk from anywhere in the world with the help of FTP. Data are transmitted in high speed so that nice theory can be put into impressive practice, and a whole new world of using a satellite TV receiver is opened up. Just imagine a new movie premieres on TV while you’re on holiday and with all the helter skelter right before departure you forget to set the timer for a recording.Not a problem: If you have access to the Internet at your holiday destination you can remotely create a timer entry, check if all existing entries are correct and verify whether recordings have actually been made. And as if that’s not enough, you may even use FTP to transmit TV or radio content from your home right to your holiday destination. 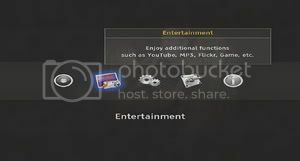 The ‘Entertainment’ menu item is a first step byTopfield to wards blurring borders between receiver, network and Internet. For instance, you may use the TMS to look for videos on YouTube and watch them on your flat screen in the living room. Naturally we gave this feature a try and as it turned out it worked flawlessly.The TMS is just as versatile as the YouTube web portal and even displays a list of most watched or top rated videos. Alternatively you may watch photos on Flickr or share them with friends, and if you want to find out the weather for the day the TMS SRP-2100 features a dedicated menu item for that as well,Broadband providing a forecast for almost any location worldwide. In addition, the TMS can of course be used as an MP3 jukebox or a picture viewer with individual or slide show viewing. If you have down-loaded DivX movies from the Internet you may even watch these with the Topfield TMS.The Battle Tank video game adds icing to the multimedia cake and can be played alone at home, or with friends on the network. Topfield was the first manufacturer to create a platform for resourceful hobby developers to implement new features in the receiver’s software. The name of the game is TAP and stands for Topfield Application Protocol.Users may use TAP applications to customise their boxes even further and to add new functions.Topfield began to integrate TAP many years ago and so it comes as no surprise that TAP is a defining feature of the TMS software as well. While TAP applications written for older Topfield receiver scurrently will not work on the TMS the manufacturer has stated that the interface per se hardly changed so that it will be not too difficult to recompile existing TAP applications so that they will become compatible with the TMS within a short period of time. With its Multimedia HD Receiver Topfield TMS SRP-2100 is among the first receiver manufacturer to enter uncharted territory by making the Inter-net an integral part of its product. Naturally, the quality of many YouTube videos is way below that of satellite transmissions, but change happens and YouTube is investing heavily in new compression technology so that a number of videos are already available in high definition.The impression we had of these was very good and sooner or later the end user will no longer think about where TV content comes from, as long as it arrives on the screen in good quality.